The Panama Canal Expansion project and its impact on the real estate market and the global shipping supply chain. 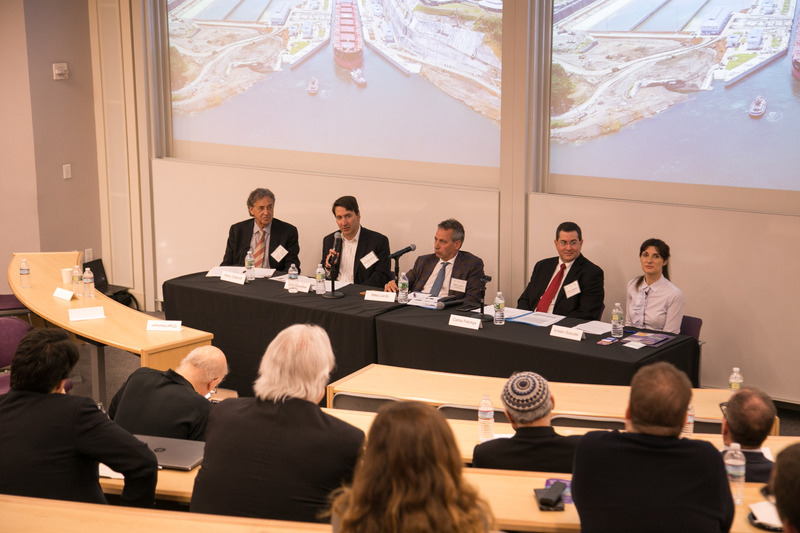 Professors Kristen Sosulski and Harry Chernoff moderated a panel comprised of experts in logistics (Bob Silverman), real estate development (Michael Landy), and the Panama Canal (Carlos Fabrega). The topic of discussion was on the effect of an enlarging the Panama Canal, a waterway connecting the Atlantic and Pacific Oceans, on U.S real estate and the global supply chain. Courtesy of NYU Photo Bureau. The Panama Canal expansion is a truly remarkable infrastructure project. Updating the existing Canal, first built in 1914 was no easy feat; it came with huge expense, politics, and litigation. A project costing over 5.2 billion USD was necessary to keep Panama relevant. A country of approximately 4 million people and little in terms of natural resources, the Canal is their natural resource accounting for 30 percent of the country’s GDP. An expanded canal would allow for larger containerships to transit the Canal, translating to more cargo and an expanded revenue stream. The Canal was constrained by the size of its three locks which limited its capacity. Vessels were unable to use the Canal because they were larger than the 4,500 TEUs, the maximum size. By adding wider and deeper third lane to the Canal was the way to service the larger vessels. The scope of the expansion project was determined by the highest profit user, the containership. The Panamax containership, 3,400 to 4,500 TEUs, represented the greatest revenue for the Canal. Containerships accounted for 24 percent of ships going across the Canal in 2015, 34 percent of total tonnage, and 48 percent of total revenue. The world fleet of containerships has been moving towards larger vessels (12,000 – 18,000 TEU’s). By 2020, without the expansion, the Panama Canal would only able to service 32 percent of the world’s container vessel fleet. 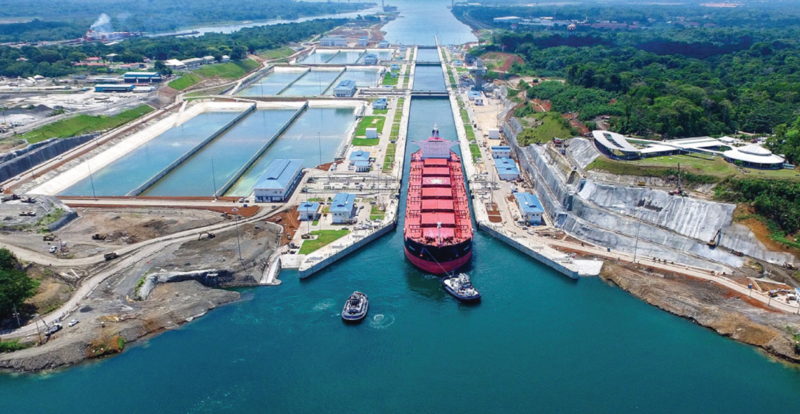 With an expanded Canal Panama could accommodate 80 percent of the world’s containerships by 2020. The third lane expansion was designed to accommodate containerships carrying up to 14,500 TEUs. The cost for these vessels for one transit (approximately 48 miles) is one million USD or more. Figure 1. The new third lane of the Panama Canal on the Atlantic entrance. The expanded Canal has been up and running for almost 2 years. This expansion has led to expanded markets and new diversification opportunities for Panama. While the overall number of transits is not increasing significantly, the amount of cargo transiting the Canal has been. On average, the canal transits 35 to 40 ships per day. With the expanded Canal, the transits have increased marginally by two to three ships per day. There are bigger vessels using the canal some expected and some unexpected. For example, vessels carrying liquefied natural gas have become a new unexpected customer of the Panama Canal. In addition, there’s a huge opportunity to diversify the services offer to users of the Canal such as ship repair, transshipment terminal, logistic park, and pipelines. All these services can use existing real estate around the canal (over 185 acres) previously under U.S control until the end of 1999. The impact on U.S. real estate has been significant. From the U.S. point of view, the impact of the promise of an expanded Canal was enormous. North American ports have been spending billions of dollars to prepare for these larger ships. The infrastructure upgrades include new equipment such as larger cranes, deeper berths, and redesign of container port layouts to accommodate ships carrying two to three times more per cargo than before. In the port of New York/New Jersey, the Bayonne bridge was raised to allow 12,000 TEU and larger ships to pass through to one of the larger consumer market gateways in the world. These megaships carry 45 percent of the world’s cargo and will be able to take shorter routes creating savings in time and fuel by using the canal. Competition among the east coast ports and between the east and west coast gateways has exploded. Over the past ten years, container traffic has been shifting from the West Coast to the East Coast ports. The market share of TEU volume in 2016 is close to an even 50-50 split between both ports, a seven percent change from the 2006 division of 57% (West) versus 43% (East coast). Inland ports have also been developing, as larger ships make less stops (or port calls). Storage centers for ecommerce business, big box retailers, and warehouse tenants have expanded or relocated to more strategic positions in the global supply chain, closer to the major east coast hubs. The effect on the global shipping supply chain has led to new investment, major cost savings for the end-users and the creation of innovative opportunities and services for the logistics and real estate development industry. Overall, the creation of the Canal expansion infrastructure has caused substantial increases in real estate values in the ports themselves, and in surrounding areas. Kristen Sosulski is an Associate Professor at NYU’s Stern School of Business and the Director of Learning Sciences for the NYU Stern W.R. Berkley Innovation Labs.